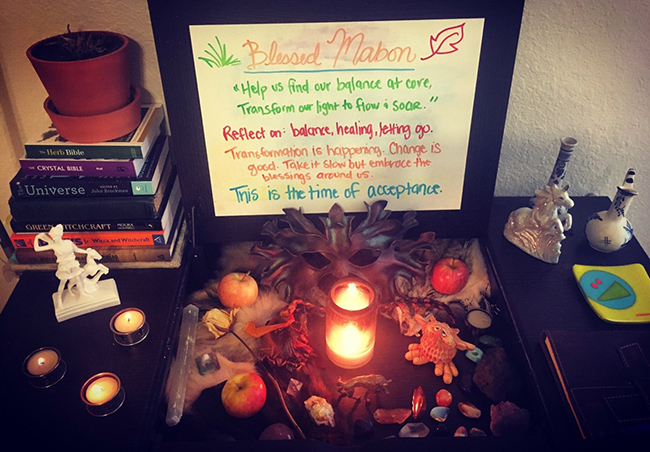 Blessed Mabon! Some Reflections & Gratitude. The circle is open but never broken. Happy Mabon my friends and blessed be. Today (last night) marks the beginning of my favorite time of the year: Fall! 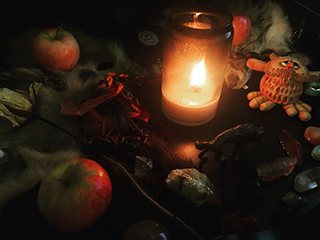 It is the Autumn Equinox and as the Crone begins her transformation, I canâ€™t help but feel this is my own transformation, for better or worse. Today the wheel turns towards a longer night and shorter day, giving our minds more time to reflect on balance, healing, and letting go of the things behind us. Today is a very personal day of celebration and contemplation. I sat at my alter and meditated for awhile on what it all means to me. This time last year I was just now discovering how sick I was getting and realizing that this drastic change to my life was only beginning. September marks 1 year of unemployment, 9 months of being dependent on my wheelchair, and what feels like a lifetime of questions that my doctors are still struggling to find answers for. Itâ€™s been a frustrating year of disappointments and scary uncertainties. But through it all, I have found light and stability in my friends and family. Today I turn my mind to celebrating the people who have been there through my heartaches and body aches, who have kept me company while dizzy from medications, who have held me in their arms while I cry at the unfair changes my body has made. From cuddly Xena marathons, braiding my hair, sending me cheer up songs, playing board games or DnD, and a thousand other things, my friends have wrapped me up in their love and have made sure I never feel alone. Today I celebrate them and reflect in the gratitude I feel for the balance they bring my life. I love you all so much. Thank you for your kindness and unwavering support and understanding. 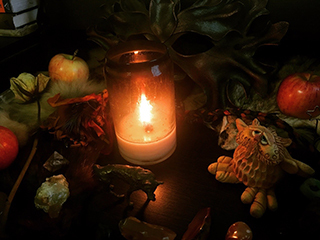 My alter is ready for Autumn and so am I. I continue to take my life one day at a time and I put my faith in my friends and my Gods and myself. Today I will work to find balance and acceptance as this old Crone moves forward with renewed vigor.